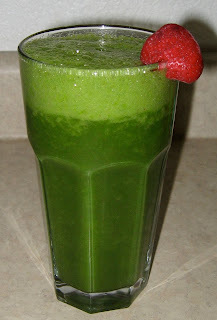 During my recent raw foods search online, I came across the most simple and nutritious recipe ~ The Green Smoothie. Ever since, we have been really enjoying this way of consuming raw greens. It is truly delicious and I want to share it with you! There are endless possibilities to the green smoothie! Try it with fruits you love and you will certainly love the smoothie! You can use any fruit and any green. It is recommended to start with 60% fruit and 40% greens to mask the bitter green flavor. You can later adjust the ratio to more greens as you adjust to the taste. The fruit really sweetens it and makes it really delicious! It is also recommended to use different greens to get the most balanced nutrients since they all have a different ones. Spinach is a great one to start with. Greens are the most packed with nutrients and the most alkalizing food! They are truly medicine for the body! 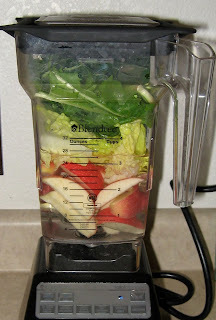 If you have a BlendTec blender, simply blend on the Whole Juice or Smoothie setting and enjoy. If you have a regular blender, just make sure to blend really well so it liquefies. You may want to start with softer fruits and greens to see how your blender does. We had been juicing this type of food for quite some time, but juicing takes out the fiber, which acts like a sponge to carry out toxins. Juicing is also more expensive since we have to use a lot more quantity of food to make the same amount of juice. Plus, juicing takes longer. The smoothie recipes literally take less than 5 minutes from start to finish and clean up is incredibly easy. Now that spring is just around the corner, according to Chinese Medicine, it is time to support the liver. The spring energy is represented by the color green and the element of wood. It is a great time to get more greens into our bodies to cleanse out stagnation from the winter months. The earth itself bursts with the color green and we can tune to this, bursting forth with life and a new sense of energy. May the green smoothie support you in this spring energy of rebirth and creativity! This entry was posted in The Cornucopia and tagged Greens, Healthy Living, Raw Food, Recipes. Bookmark the permalink.